The Winix 50 Pint Dehumidifier WDH851 is a medium capacity room dehumidifier with the capability to operate effectively in areas of up to 1000 sq ft. This dehumidifier is ideal for use in most areas of the home including kitchens, bathrooms, laundry rooms, bedrooms and living areas. This dehumidifier is particularly well suited for use in a small to medium sized basement where the capacity for continuous drainage is almost essential. Not every basement, however, has a convenient, floor level drain or other outlet to permit a gravity fed drainage system. The Winix 50 Pint Dehumidifier offers the advantage of an integral condensate pump that will lift the water up to 15 feet to enable drainage to a more distant outlet at a higher level. With auto-restart this is a dehumidifier which can be left unattended to do its essential work while you are away from home for a few days. The appearance of this dehumidifier is pleasing to the eye and the unit is compact and portable. The WDH851 is an Energy Star™ qualified and energy efficient appliance which includes an impressive number of features for ease of operation and effectiveness. The unit comes with five year warranty on the sealed refrigeration system and a one year limited warranty on the unit as a whole. The Winix 50 Pint Dehumidifier WDH851 has a water extraction capacity of 50 pints per day at 80°F and 60%RH. The amount of moisture a dehumidifier can remove from the air varies with temperature and relative humidity. If either one, or both, rises or falls the amount of water removed from the air rises or falls accordingly. In order to provide a standard by which dehumidifiers can be compared the Association of Home Appliance Manufacturers (AHAM) has set the 80/60 standard for independent testing of dehumidifiers. All companies that belong to AHAM subsrcibe to this standard. The manufacturer recommends this unit for areas of up to 1000 sq ft. The Winix 50 Pint Dehumidifier WDH851 deposits the water removed from the air into an internal container. The container, often called a bucket, has a capacity of 17 pints. Because the bucket has to be physically removed from the dehumidifier to dispose of the water it cannot be too large or it would become uncomfortably heavy to remove and accidental spillage would be more likely. A bigger bucket would also require a larger dehumidifier, an unhelpful side effect where space is restricted. The bucket cannot over-flow as there is an automatic cut-off mechanism which stops the dehumidifier operating once the container is full. An indicator light on the control panel is illuminated whenever this occurs. If emptying the bucket is an unwelcome chore the unit can be continuously drained to a convenient outlet. This can be done by a simple gravity feed but an integral condensate pump is incorporated in the dehumidifier which will allow drainage to an outlet up to 15 feet above the unit's location. The Winix 50 Pint Dehumidifier is a compact unit for a dehumidifier of high power and has a foot-print of just 15.75 x 13.3 inches. This is an advantage for a room dehumidifier that may be used in a variety of locations, in some of which floor space may be limited. The unit is also portable and features a set of caster wheels for easy movement across unobstructed floors. The unit weighs a little under 42lbs, about the weight of a four to five year old child. If the dehumidifier has to be carried to avoid obstacles or to negotiate a stairway two recessed handles on the upper side of the casing provide a firm and secure grip and its modest dimensions make this unit a manageable load. The design of the WDH851 is stylish and modern and it will not look out of place alongside contemporary furnishings or hi-tech appliances. The Winix 50 Pint Dehumidifier WDH851 offers ease of use due to its electronic controls with soft-touch buttons and and easy to read digital display. The control panel provides access to the extensive range of options for configuring operation of the unit. Humidity is controlled by means of an adjustable humidistat within a range of 35% to 70% relative humidity, and an on-off timer allows the unit to be programmed for operation at your preferred intervals over a twelve hour period. The unit may be set in either of two operating modes. In Comfort Mode the dehumidifier independently manages relative humidity to maintain a comfortable environment. It monitors the level of relative humidity in the room and switches to the most appropriate fan speed to ensure energy efficient operation. In Continuous Mode the unit will operate, as soon as the humidity button is pressed, if relative humidity exceeds 70%. In this mode operation will be continuous until the setting is adjusted or the unit is switched off. The dehumidifier has an auto-defrost feature which allows the unit to operate down to temperatures as low as 36°F which may be important in areas which experience cooler temperatures, especially at times when a home is unheated. It would not be safe to assume, however, that this dehumidifier would be suitable for continuous operation in very low temperatures. A more specialized, heavy duty unit would be needed if, for example, a very cool basement required dehumidification. The Winix 50 Pint Dehumidifier WDH851 requires very little maintenance. It contains an air filter which captures air-borne particles which could degrade performance of the unit if allowed to enter. The filter is washable and should be removed and cleaned every couple of weeks to maintain the performance, and prolong the life, of the dehumidifier. While is is disappointing to hear of a few examples of defects on delivery these are not uncommon on almost any brand of dehumidifier, or any complex product with moving parts for that matter. We do not feel that these isolated incidents seriously detract from the virtues of this unit. 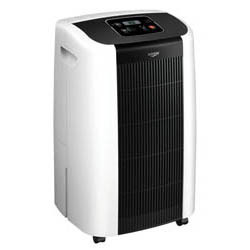 The Winix 50 Pint Dehumidifier is a well made and effective appliance with all the characteristics needed for use in a moderately sized basement and we are happy to recommend it to our visitors.